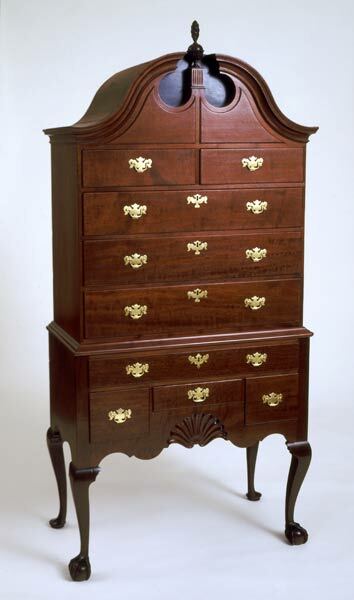 The high chest of drawers- a form of furniture produced throughout much of the eighteenth century in North America- was used to store linens and clothing. This particular high chest bears the understated design and construction features associated with cabinetmakers in Newport, Rhode Island. The simple, almost prim, lines and diminutive scale are enhanced by ball-and-claw front feet and pad rear feet, by a carved shell on the apron of the case, and by a closed scroll bonnet surmounting twin raised panels fronting the scroll board. From the mid-1750s until the Revolution, Newport developed into an important center for furniture production, rivaling even Boston in its number of craftsmen. During this period Newport- and especially the workshops of two Quaker families, the Townsends and Goddards- became known for the consistency in style and superb craftsmanship of its furniture, which was made for the state's mercantile elite and for export to other cities along the eastern seaboard and beyond. Comparison of Newport high chests with more highly carved and ornamented examples made in Boston, New York, and Philadelphia underscores the restrained elegance of pieces from the Rhode Island port.